Monsieur Salut writes: roll up, roll up to place your predicted scoreline for the opening game of our return to the third tier – or to claim old prizes I somehow overlooked (one Evertonian, Bernard Walker, is in that category and will receive his I-won’t-let-this-change-me award, a mug, for correctly forecasting the dismal result of last season’s League Cup game, as soon a possible. What is the season likely to bring? It is right that some of the SAFC jury is still out and inclined to convict. Brianm, commenting here, complained about the “sycophancy allotted to Donald based on his loving the sound of his own voice” and is speaking sense when he adds that actions speak louder than words. But for many of us, while not feeling remotely sycophantic or even unreasonably optimistic, Donald and his manager, Jack Ross, have made a decent start, buying or borrowing or getting for nowt players who want to fight for SAFC and may just be right for the sorry level to which we have descended. To business: Guess the Score is back. I will do my best to offer a prize mug – Sunderland ones for our supporters, appropriate alternatives should opposing fans win – as often as possible. The cost, and the general running costs of the site, explain why we sometime accept sponsored links from articles. In an ideal world, it wouldn’t be necessary; in the real world, it’s unavoidable. I have no idea whether the players now available to Ross will be up to the challenges of League One. But I intend to give them, Ross and the owner a fair chance and, like Salut! Sunderland deputy editor Malcolm Dawson, will “will stay patient if we aren’t running away with the league”. We have our first Who are You? interview in the bag and it will be published tomorrow or Thursday. Not Boy George, a Charlton fan, whose representatives did not bother to respond (beyond an acknowledgement) to our approaches, but a good set of answers all the same from Richard Wiseman, chairman of the Charlton Athletic Supporters Trust (CAST). Salut! Sunderland: hand on heart, where will our clubs finish this season? Richard: Sunderland really ought to win this division. If Wigan, Blackburn and Rotherham can bounce straight back then so should you lot. If there is no imminent sale of our club I suspect we will be top half but no better. That will mean our longest stay at the third level since we left it in 1929. Thank you Mr [Richard] Duchatelet [Charlton’s coontroversial owner]. Meanwhile, have a go at the competition whoever you support. Usual rules apply: whoever is first with the correct scoreline, to be posted before kickoff, will receive – to a UK address only – a prize mug. Eventually. I’d meet you for a pint John if it wasn’t such a ridiculously early kick off! It’s about time I had a pint – the last one was 14 months and 62lbs ago! St Mirren revisted 6-0 and please run out in black shorts lads! I fear you’ll have to get used to red, Malcolm, but I could be wrong. Would it be possible for you to organise a survey on preferred names for our stands? I’ll put it to the boss Eric. I’m going for a buoyed 3-1 home win. Agreed. It’ll take us a while to get into gear. Fower nowt, McLaughlin to become an instant hero (and God don’t we need a goalkeeping hero) by saving an early pen. A home win but all the sensible scores have gone. Feeling good (for the first time in a long time), I’ll go for 3-1 to us. 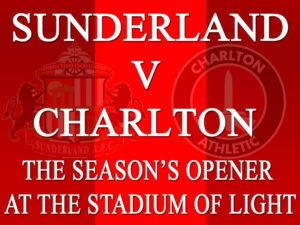 Having said that, Charlton will now go and win! I fancy us to score for fun this season and was going to forecast 4-0 but that score has been taken so must go 5-0, mad fool that I am!. Fower nowt translates to 4 – 0 Mel. Have another go.